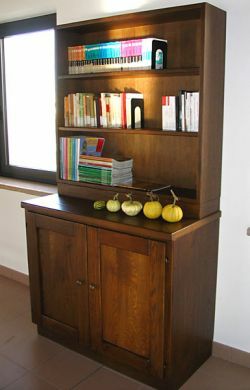 We create house and church furniture with solid oak and fir wood. 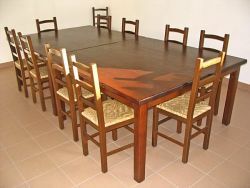 Tables, chairs, armchairs, chests, beds, bookcases and wardrobes are the main items of house furniture. Chairs, stools for prayer, altars, and pulpits are the church furniture. To them we add furnishings, such as bookrests, stands for artistic plates, and trays. Our furniture and furnishings can be seen in the different rooms of the monastery. Our furnishings are on display in the hall next to the reception room of the monastery.